March 20, 2019 | Filed under: Current Articles,Featured | Posted by: Alex A. Every competitor has experienced that dreaded moment when the pressure is on and, for some unknown reason, their mind takes a holiday. What pattern? Extend the trot where? What are logs doing here? Which side of the cone am I supposed to be on? In the past, show nerves were exacerbated by the pressure of having to memorize patterns with little prep time before an event. Trainers and competitors juggling the excitement and energy of time crunch at the horse show found it difficult to do their best under those circumstances when only given a few minutes to learn a complicated series of maneuvers. In recent years, organizers of major events recognized that people are traveling longer distances to shows and making a substantial investment of time, effort, and funds to be there. As a result, associations like AQHA, APHA, and NSBA have made a big step toward making the journey more enjoyable and less stressful on show day by publishing patterns online for events like Showmanship, Trail, Horsemanship, and Equitation. 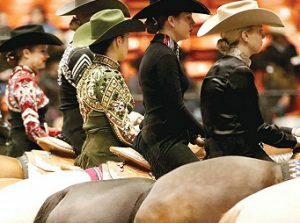 Competitors and trainers with busy lives now have the ability to study, learn, and perfect those patterns weeks, and even months, before show day, enhancing the preparation process and hopefully taking a bite out of show nerves. However, this technological convenience can become a double-edged sword. When given that much information ahead of time, some riders overdo it, resulting in horses that anticipate cues, become sour to specific maneuvers, and riders who overanalyze to their detriment. So, what guidelines should riders and trainers follow when it comes to pattern practice ahead of the show? Reid Thomas of Boerne, Texas specializes in matching riders to horses to develop winning combinations. He and his clients are consistently in the ribbons and have earned a number of World and Reserve World Championships and Congress Championships. Their accomplishments are gained through a carefully developed training regimen of organization and preparation, including mastering patterns before a show. Jenell Pogue has been riding for thirty years and training for the past twenty. During her career, she has won multiple World and Congress Championships in both AQHA and APHA competition. She worked with Vickery Quarter Horses as a youth and Brian Isbell after graduation from Purdue University. She and her husband, Ryan, live on their farm in South Bend, Indiana with their two-year-old daughter, Jayna Rose.